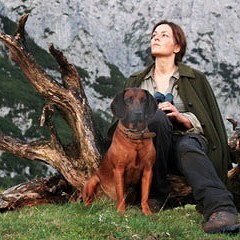 In this low-key sci-fi drama, Martina Gedeck plays a woman who travels to a secluded cabin in the mountainous Austrian countryside; one morning she finds that an invisible wall surrounds the valley on all sides, and after numerous attempts to escape she resolves to lead a life of solitude. Based on the 1963 novel by Marlen Haushofer, a sort of transcendental character study, the film is an elegant, slow-burning exercise in narrative minimalism; director Julien Pölsler never fully explains the origins or purpose of the wall, favoring mood over logic. In German with subtitles. The Wall, The Wall, The Wall, The Wall, The Wall, The Wall and The Wall are not showing in any theaters in the area. What's going on in The Wall? Martina Gedeck stars as a woman trapped by an invisible barrier.